Entries for the annual James Dyson Award are closing soon, so Dyson has sent us some of the very best entrants so far. If you're a student with a penchant for design or innovation, you're also encouraged to enter your own project, too. Some of the projects submitted so far are really impressive so without further ado let's look at three of the best. As reported by the NHS, Tinnitus affects 10% of the UK population, Pulse solves this problem by monitoring sleep and responding with sounds depending on the depth of your sleep. Problem: Tinnitus can be a debilitating illness. 1 in 100 people suffer from tinnitus so severely that it affects their quality of life and can lead to mental disorders including anxiety and depression. There is no single treatment for tinnitus as each sufferer experiences a varied range of tones and pitches in their ear – no case is the same. Tinnitus becomes much more noticeable when there is no background noise and therefore can drastically disrupt sleep. Jack's initial research into tinnitus revealed the real breadth and depth of the problem, the distinct lack of solution to the problem was also worryingly evident. One popular method to alleviate tinnitus is sound enrichment which helps people cope with tinnitus by creating background noise. However, this just 'masks' the tinnitus and prevents the sufferer from becoming aware of it. Having suffered numerous head injuries, Jack now suffers from mild tinnitus. Although this does not affect him too much just yet, his Grandma suffers from tinnitus with the condition affecting her sleep – this was Jack's inspiration to find a solution to the problem. Solution: Pulse subconsciously exposes sufferers to silence during their sleep, drowning out the ringing sound due to Tinnitus. It does this by emitting a sound of your choice from the device which you leave on whilst falling asleep. Once the user is asleep, sleep quality is monitored using a wrist mounted wireless accelerometer. As the person drifts into a deep sleep, the device turns the music off, allowing the person to sleep through silence, subconsciously. If the patient begins to wake up, the wrist monitor will detect the disturbed sleeping pattern. To prevent to user waking up, the original sound is turned back on. Whilst the accelerometer monitors sleep, the base unit can be placed by the bed or under the pillow. The base unit emits sound enrichment when required. 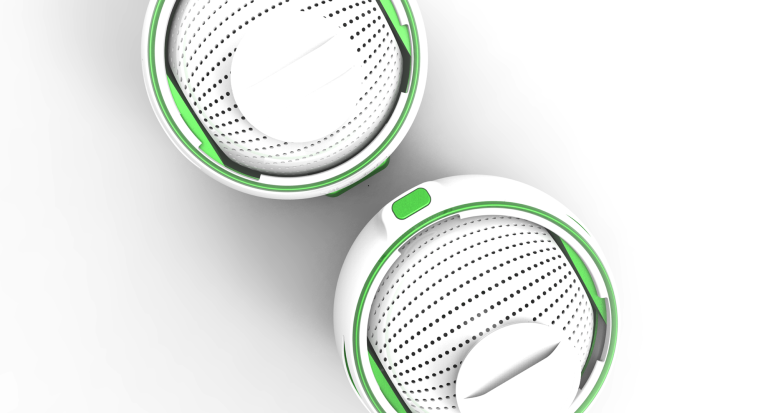 Jack developed 15 prototypes before identifying a workable solution. Each prototype had a varying level of complexity. Electronic and aesthetic prototypes were created with the final prototype incorporating both electronic and aesthetic functionality. The average person in Britain uses 150 litres of water a day and up to 30% of it is wasted. The UK has less rainfall per person than other northern European neighbours, and London is drier than Istanbul. To compound the issue further, Waterwise estimates that 25% of all household bills come from heating water. Problem: Water. We all need it to sustain our bodies, water our crops and power our economy. The United Nations estimates that Europe alone wastes one third of its water. In Britain, The Energy Saving Trust found that £68 million a year is wasted just by boiling water in overfilled kettles, wasting both water and energy. The act of filling kettles was proven to be the biggest factor in excess energy consumption when boiling water, excess water is boiled but not used and subsequently thrown away to make room for fresh water. Solution: Otis was designed with two objectives, to save water and energy. Its creator, Paul Blainey was inspired to create the Otis whilst studying for his Master's degree. He was shocked at the amount of water that is wasted given this precious resource is providing for seven billion people and counting worldwide. Paul has spent over a year developing Otis. It is the first fully integrated solution to boiling water using induction technology and a smart phone app. Otis is integrated into the plumbing system and with a simple touch of the smart phone app you can fill Otis with exactly the right amount of water. The Otis is neat and today with a small physical footprint. By combining induction technology with dry boil detection, Otis knows when to fill the vessel and with the right amount of water. The user can even select to have water boiled at a pre-set time and remove the jug when it is needed. This will save millions of gallons of water a year and contribute to reducing wasted water globally. The recommended noise level of hospitals is 35dB, research has shown that the average sound level of 72dB. High levels of noise are associated with negative physical and psychological effects on patients. Ultrazenic Panel alleviates these symptoms by combining active noise cancellation with a sound field that encircles the patient's head, reducing noise level up to 60%. Problem: In 1859, Florence Nightingale stated 'Unnecessary noise is the most cruel abuse of care which can be inflicted on either the sick or well.' To date, research supports Nightingale's comments. Studies have highlighted that high levels of sound have negative physical and psychological effects on patients. For example, exposure to sudden, unexpected noise raises patient heart rates and has been proven to have a negative influence on patient recovery times. Further to this, chronically high levels of sound, tend to increase blood pressure levels. This disrupts sleep, increases stress, and decreases patients' confidence in the competence of their clinical caregivers. These problems can be expected to worsen too: research from Johns Hopkins University revealed that hospital noise levels have increased steadily over the past 50 years. Since 1960, average daytime hospital sound levels have risen from 57 decibels to 72, while average night time levels have jumped from 42 to 60 dB—all far exceeding the World Health Organisation's recommendation of 35 dB as a top measure for sound levels in patient rooms. Solution: In October 2014, Jeffrey was able to conduct Q&As in various hospitals to gain a deeper understanding of the hospital environment. The breakthrough for Jeffrey was when Peter Thompson of Queensway-Carleton Hospital in Ottawa introduced him to parametric audio technology. In January 2015, Jeffrey merged active noise cancellation with parametric audio and received approval from the department, user testing also proved successful. The Ultrazenic Panel was born. The Ultrazenic panel increases patient comfort, healing, empowerment and provides control over their immediate environment. By combining active noise cancellation with generation of a sound field that encircles the patient's head, reducing noise level up to 60%. For optimum comfort, a wall and ceiling mounted design have been developed. The patient can control the device through an app, opting for music or silence. Conventional washing machines use in the region of 50 litres of water per load. This is wasteful and energy hungry. Drumi offers a low-cost, environmentally-friendly option for washing clothes. Problem: Washing machines are inefficient, using approximately 500 watts of power and 50 litres of water per load. Solution: The Drumi is a small, sustainable, lightweight foot powered washing machine that uses no electricity. How does it work? Simply place personal items into the drum, add five litres of water and detergent through the detergent tray. Press the foot pedal consistently for two minutes, then release soapy water with the press of a button. Add another five litres of water and pump for another two minutes to rinse, release the water again, and pedal for an additional minute for the spin cycle. Hang clothes to dry. On average, a regular sized washing machine will create approximately 10 pounds of carbon per week. Since the Drumi reduces the use of regular sized washing machines, it can reduce the user's carbon footprint by approximately five pounds weekly.